The first time I heard the phrase "Cannoli Truck" I was convinced it was a New Haven urban legend. The city has trucks and carts filled with almost any cuisine you can imagine, but a truck filled with Italian pastries? This seemed too good to be true. Lucky for New Haven, the truck exists, and its pink and leopard-trimmed reality is far superior to any Italian pastry-filled mirage you can conjure. I discovered the truck early this summer, first as a hot tip from a New Haven friend excited to have a new truck to add to the city’s burgeoning food truck and cart scene. And then as luck would have it, the truck frequently parks in the neighborhood near my New Haven office, so I’m lucky to “stumble” into it, in all its 7 cannoli-flavor glory. My first Cannoli Truck experience was my baseline–a traditional cannoli of velvety sweetened ricotta studded with chocolate chips and encased inside a crispy and flaky pastry shell. 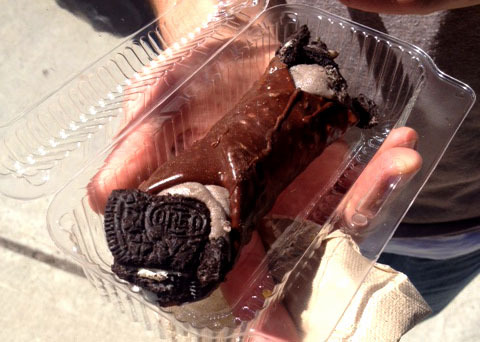 On a subsequent visit, I opted for Andrea’s recommendation of one of the truck’s best-sellers, Oreo, which is filled with a cookies and cream flavored ricotta and encased in a chocolate-dipped shell. It is an incredible combination and variety of textures–the dense flakiness of a perfect Italian pastry shell covered in smooth chocolate, a thickly sweetened filling, and shards of actual Oreos. I’m afraid there is no turning back from here. The flavors most frequently offered include: traditional, chocolate dipped, Oreo, Peanut Butter, and Maple Bacon as well as seasonal favorites such as Pumpkin Spice, Apple Pie and a few in regular rotation such as Mounds Bar, HeathBar and German Chocolate. I’ll be doing my due diligence and working my way through this list, you can count on that. The cannolis are hands-down, some of the best I’ve ever tasted. But much of the appeal of this truck lay beyond its Italian cannolis (and pignoli cookies and other Italian treats it offers). It’s also the owners and a very good cause. "The truck has been a dream we finally started in May of this year.” said Meriano. “The motto 'leave the gun, take the cannoli' is from the Godfather film. We feel it's a nod to leaving the violence and enjoying the sweet things in life.” Fitting words, a terrific cause, not to mention some very memorable cannolis. Cannoli Truck’s cannoli’s are $3 each and also available for catering. You can also Find out where the Cannoli Truck is on their daily Facebook posts or online at cannolitruck.com.